Herndon hit the studio with DJ Little Steve to cut four songs which will debut each week for the next four weeks, the first being a cover of Whitney Houston’s “I Wanna Dance with Somebody.” Herndon debuted the dance mixes during Market Days in Chicago this past summer and the fans quickly embraced them. The “What Mattered Most” singer came out publicly in 2014 and has been one of the strongest voices within the LGBTQ community ever since. Herndon supports a variety of causes most notably GLAAD, who he partners with for his annual Concert for Love and Acceptance fundraiser held in Nashville each year. The musical extravaganza showcases LGBTQ musicians and allies. This year’s concert, hosted by Herndon and CMT’s Cody Alan, featured performances by Ty, country music icons Tanya Tucker and Vince Gill along with Cam, Cassadee Pope, Calum Scott, Michael Ray and many others. 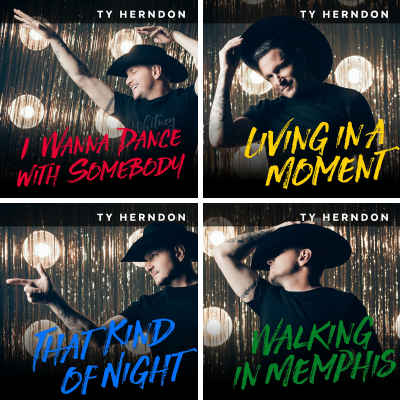 Find the most current Ty Herndon tour dates from our partners at Country Music On Tour, your trusted country concert ticket source! Country Music News Blog participates in advertising programs that help fund the operation of this site. For more information please visit our privacy statement. This entry was posted in Featured, Press Releases, Ty Herndon, Videos by Shauna "WhiskeyChick" Castorena. Bookmark the permalink. Remember When Billy Currington Made His Grand Ole Opry Debut?